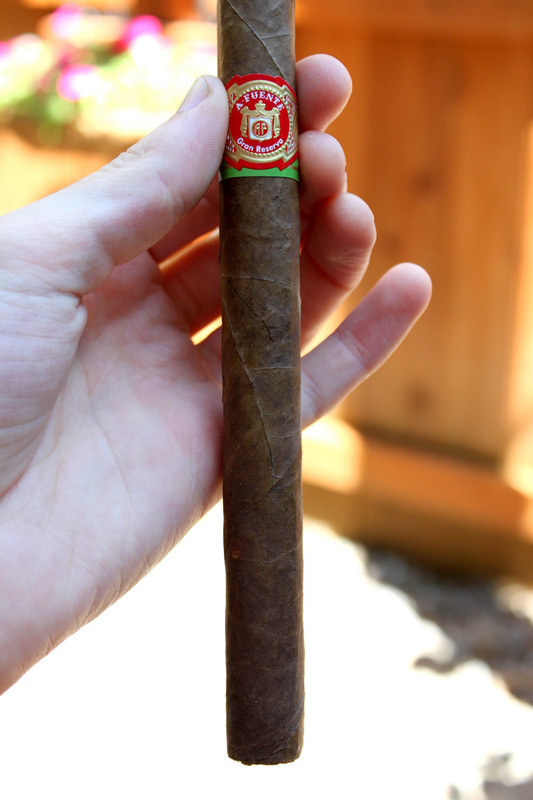 Tonight I enjoyed an Arturo Fuente Gran Reserva Churchill that was given to me by a good friend of mine. I’ve been blessed with many friends, including a few who bless me with cigars from time to time – that is always a treat. I’ve probably had five of these Dominicans before, and I have found them to be very consistent in terms of taste, build, and overall quality. The only problem I’ve consistently noticed with this cigar is difficulty achieving an ideal amount of smoke on the draw. The construction of this cigar, however, was a bit disappointing. It was not packed consistently, and I noticed spots of discoloration (you can see them if you enlarge the image above). There was slight peeling on the natural wrapper as well. As mentioned, though, this is not characteristic of this line of cigars, at least in my experience. The other four in my humidor show none of the same problems, so I’d say the construction here is an exception to the rule. The smell of the wrapper was faintly sweet with a hint of nut and cedar that really exploded after I lit the cigar. The first third was mild in strength and body, with subtle nuttiness to the taste and a sweet aroma, which I really enjoyed. There was also a bit of leather in there – a nice touch. The burn wasn’t very even, which bothered me, but I found that it had evened itself out by the second third. The last two thirds were very similar – not a lot of change as far as taste goes, which to some might be a disappointment. The cigar did take on more body as it burned closer to the label. After I took the label off, however, the smoke became bitter and the cigar overheated. That really annoyed me, because I typically enjoy the last few minutes of a cigar the most. 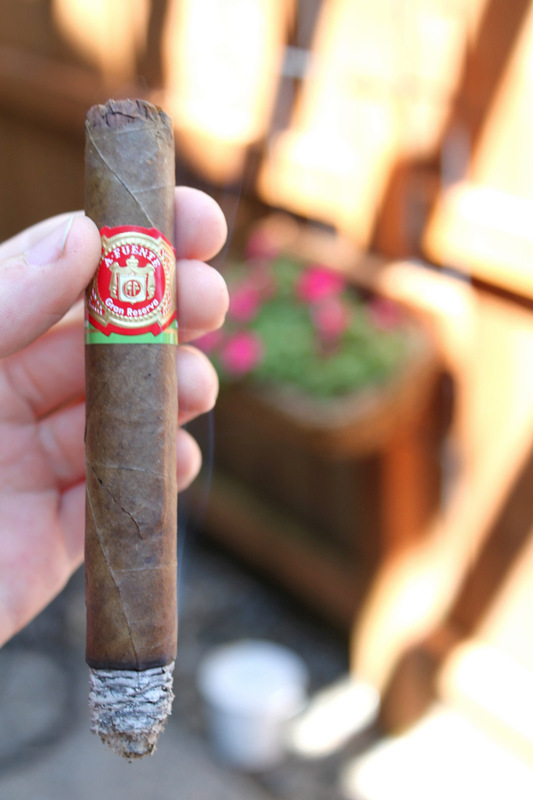 I’ve never smoked a Fuente that I didn’t enjoy, and this cigar was no exception. I’ve seen this particular cigar described as a medium bodied cigar, but I feel like that is a stretch – seemed mild to me. There were a few problems for sure, but for a cheaper smoke (~$5-6) I have a hard time not recommending it to anyone looking for a mild or mild-medium cigar. 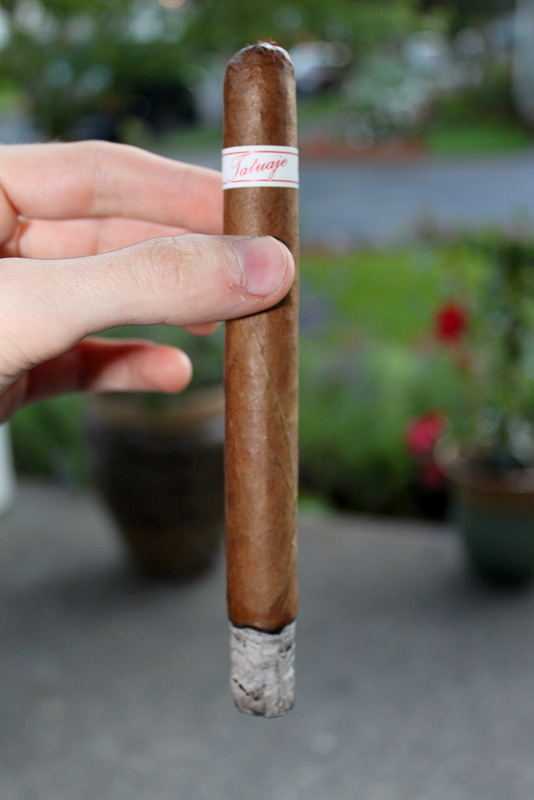 The Tatuaje P4 Churchill that I enjoyed this evening was a strange cigar. Lots of highs, and about as many lows. From what I’ve read from other reviewers, P4 line cigars are normally medium bodied cigars. Tonights stick just couldn’t seem to decide whether it was a mild, medium, or full-bodied cigar. 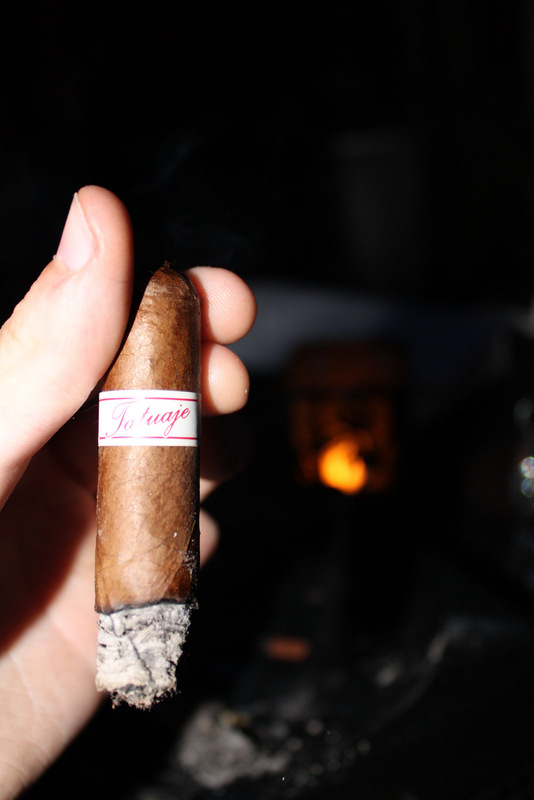 Throughout the smoke, I took notes on the flavor, aroma, and construction of the cigar. – Before lighting, I took note of the construction of the cigar. Seems to be very well put together, the texture of the wrapper is smooth and solid. The smell of the Nicaraguan wrapper is light and sweet. Feels like it is going to be a pretty mild smoke. 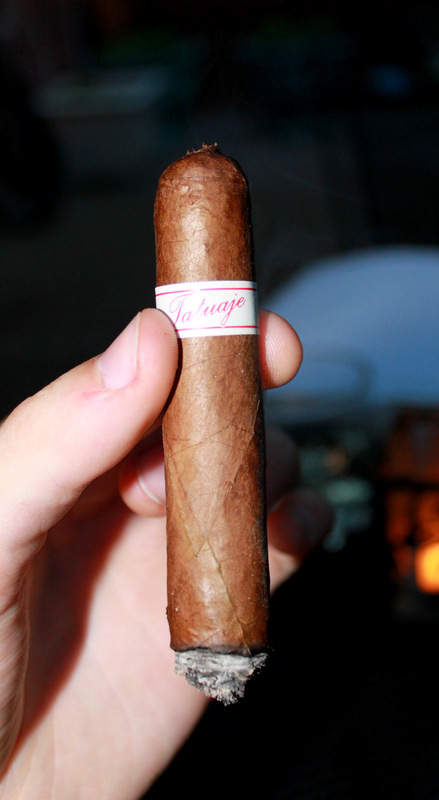 – Lighting the cigar is a bit harsh, though I’ve found that to be somewhat typical among lighter cigars. The taste is noticeably sweet, with a hint of spice to it. The aroma of the smoke is pleasantly sweet – strong, but not overpowering. Also a hint of woodiness. – About a quarter of the way through, the burn is solid – construction seems very good. The burn is creating a great ash that is mainly white with lines of grey. The wrapper smells great on the pull and complements the taste well. 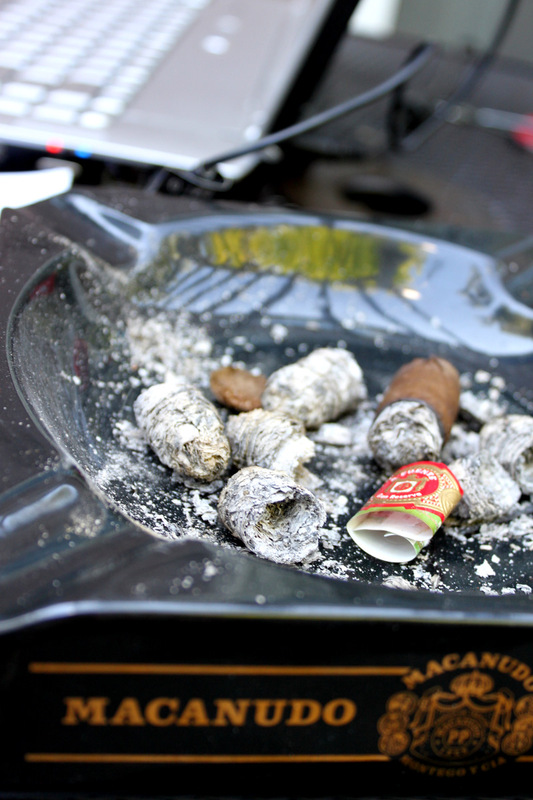 – About half-way through, the cigar is taking on more spice to the taste and aroma. Just past halfway, the sweetness has continued to be replaced by spiciness – a bit too much for my taste, and I don’t like the hint of acidity that is emerging. The burn, however, has remained almost flawless. – The last third is taking on a harshness that I do not like. This could be a sign of the filler being underpacked. The cigar doesn’t seem to want to cool down, and has started burning more quickly. The acidity and over-spiciness is making me want to retire this cigar, and if it doesn’t correct, I will. On a positive note, my black lab Toby just came outside and seemed to be enjoying the aroma – ultra spicy and harsh though it is. – Just when I’m about to put this cigar down for good, the sweetness characteristic of the first half returns like an old friend. The harshness isn’t fully gone, but it is starting to draw down. I decide to finish the cigar, and the last quarter surprises me by redeeming the last ten minutes or so of smoking. The harshness has drawn almost completely to a close, the wonderful woody sweetness is back, and it has cooled down dramatically. 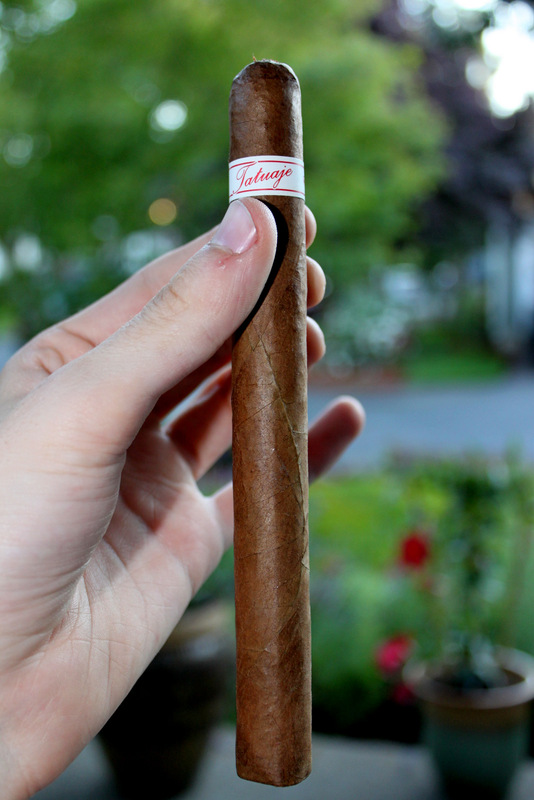 At $4 a stick, the Tatuaje P4 Churchill was almost what I expected. The construction was a huge plus, and the way it burned was encouraging. The strength of the spiciness and emerging harshness in the last half, however, made it a frustrating smoke. The cigar teetered between mild-medium body and full-body, and that lack of consistency brought the level of enjoyment way down. The fact that it toned down near the end was nice, but not enough for me to give this cigar high marks. Of course, I should disclaim that I have only had this particular stick once, so I cannot definitively caution readers away from this cigar – but I don’t plan on spending the money on it again. If you are reading this post, chances are you are aware of the new taxes that the New York state legislature have heaped onto already existing tobacco taxes in the state. And like previous legislation, the new taxes fail to discriminate between fine tobaccos usually enjoyed in moderation (pipes, cigars, etc.) and the common cigarette. But we really shouldn’t be surprised that state and city politicians seem intent to remain ignorant about basic distinctions between fine tobacco and common cigarettes. After all, it is in their interest to stay ignorant: ignorance allows politicians to to exploit the democratic process to target all smokers for funding. At its most basic level, though, fine tobacco lovers should realize that new taxes are simply a more obvious manifestation of age old politics: group a (revenue hungry politicians) joining group b (well-meaning anti-tobacco groups) to unfairly, unreasonably, and punitively tax and coerce group c (those who enjoy tobacco) out of their money and their individually chosen lifestyles. What is most interesting about New York City as a case-study for tobacco public policy is how tyrannical and simultaneously counterproductive it ultimately is. Recent decades have seen NYC develop a legal precedent for higher tobacco taxes and tighter smoking regulations. This public policy mix, however, has and will continue to have dramatically negative effects on individual liberties and the tax revenues that politicians today are so desperate to take from vulnerable groups of citizens. As the city bans smoking in more and more places, many fine tobacco lovers have had to move to lounges simply to have a place to smoke. This is a bearable scenario as long as cigars/fine tobacco stays reasonably priced. Unfortunately, tobacco tax increases push prices up, which effects customer purchase decisions – so less go to lounges. Lounges find themselves more and more burdened by taxes, regulation, and a dwindling market, and ultimately go out of business. Smokers of all types (even moderate cigar smokers) suddenly find themselves with overpriced products and no place to smoke. Anywhere. The essential result is a government mandate by the coercive power of taxation and regulation to make you live your life a certain way. 1. Government implements tobacco taxes. 2. Some people (on the margins) stop smoking. 3. Government bans smoking in public places. 4. Individuals must go to private locations (lounges or home) to smoke. 5. Government wants more money, and raises taxes the easily taxable: tobacco. 6. Taxes are passed on to consumers, and less can afford lounges/shops. 7. Tax burden and decreased market close lounges. 8. Smokers are left with almost no locations to smoke legally. 9. Some smokers break the law, many cannot afford to smoke/abide by the law. 10. Tax revenue from smoking drops off – politicians have overtaxed and exhausted tobacco users. They now turn to increasing taxes on the rich, businessman, other products, or the poor through inflation (on the federal level). Result: Individuals for all intents and purposes lose the freedom to smoke. The government has coerced (ultimately at the barrel of a gun) a particular set of values and norms on a large group of individuals. The government destroys a source of revenue. The most discouraging aspect of the current political trend, though, with respect to tobacco taxes and regulation is how obviously short sighted it is. State and city policy makers don’t understand the importance of basic incentives. As taxes rise, rational smokers will undoubtedly begin to wonder, “if tobacco is so expensive here, why not simply purchase it elsewhere where the taxes don’t apply?” Evasion of unreasonable taxes takes many forms: some may buy online, through unregistered dealers (aka the black market), or will simply drive across state lines. Thus as the state raises taxes in the hope of increasing tax receipts, they will ultimately begin pushing revenues to other states or organizations. No one benefits. State tobacco revenues will stagnate, some smokers will be forced to quit, and some will still smoke – but only after more hassle and frustration. Does all of this sound extreme? I think so. But then again, take a look at the tax increases in the past ten years, and you will realize that imagining taxes perpetually increasing really isn’t that hard. And so I am stuck wondering when politicians and those who hate any and every form of tobacco will realize that democratic theft and tyranny, aside from being morally reprehensible, actually won’t solve any problems in the long run. We’ve tried Prohibition before – why should anyone believe that half-assed Prohibition will work any better? Setting up for a very relaxing night - click and view this high-def! It's beautiful! 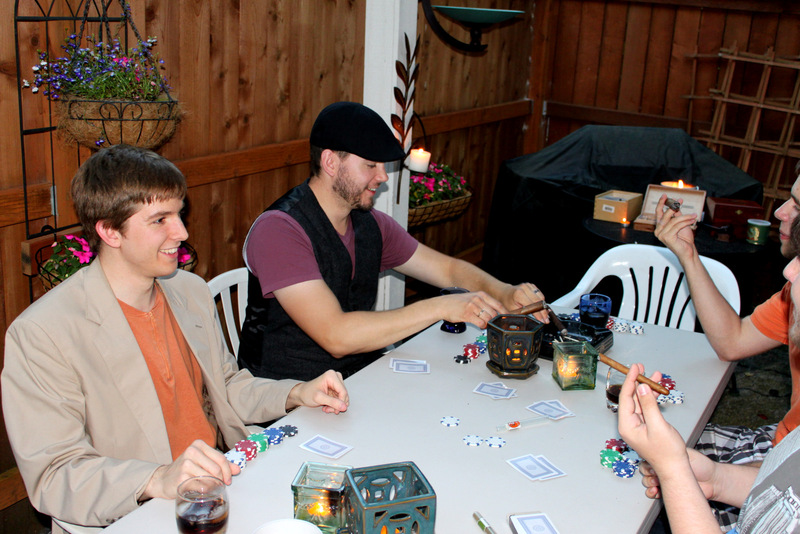 Last night at around 8:00, the guys dropped by for another night of drinks, fine tobacco, and poker. We had a few more people in attendence this week, so we expanded to a much bigger table to accommodate everyone. The temperature was a comfortable 75 degrees, and the summer evening faded slowly faded into night as we played hand after hand of Texas Hold Em’. I also got a few great pictures. Of the names on hand for cigars were Romeo y Julieta, Arturo Fuente, and Mi Dominicana. Among pipe tobacco smoked were the Cigar Inn “Mild English”, and a few ounces of the Timber Valley “Balkan II”. My first stick of the night was an Arturo Fuente Special Selection that I purchased at Timber Valley Tobacco for $4.50. I’ve always enjoyed Fuente cigars, and so as a broke college student the low price made the cigar attractive. 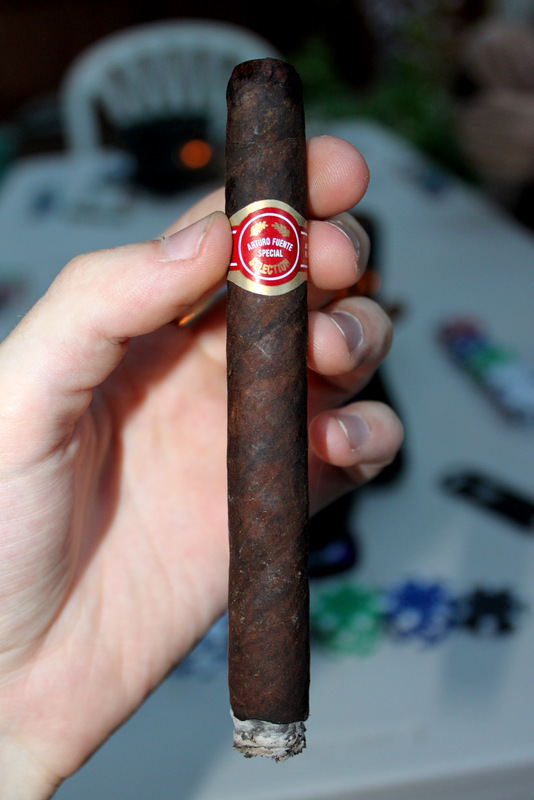 The cigar burned very evenly and had a bold spicy taste with a hint of sweetness to the scent. Definitely a good smoke and I plan on grabbing a few more next time I’m out. 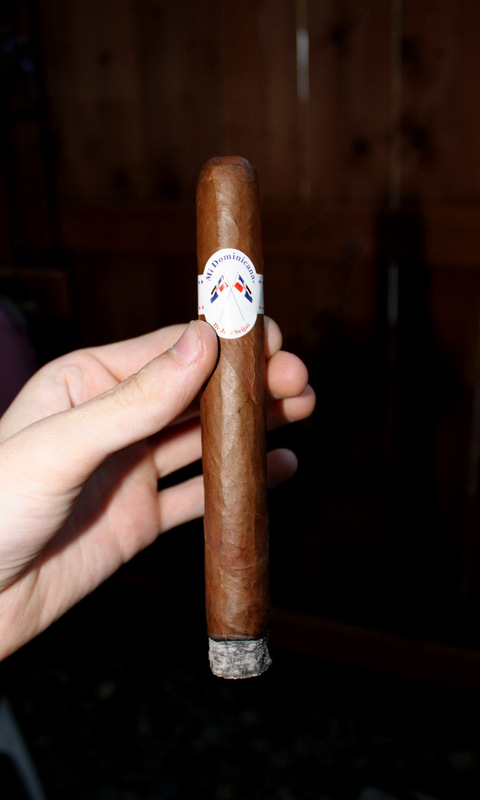 Next on hand was a Mi Dominicana, which one of my good friends smoked. I gave it a few tastes, and it was a mild-medium bodied cigar with a very unique scent that I still haven’t been able to quite put my finger on. 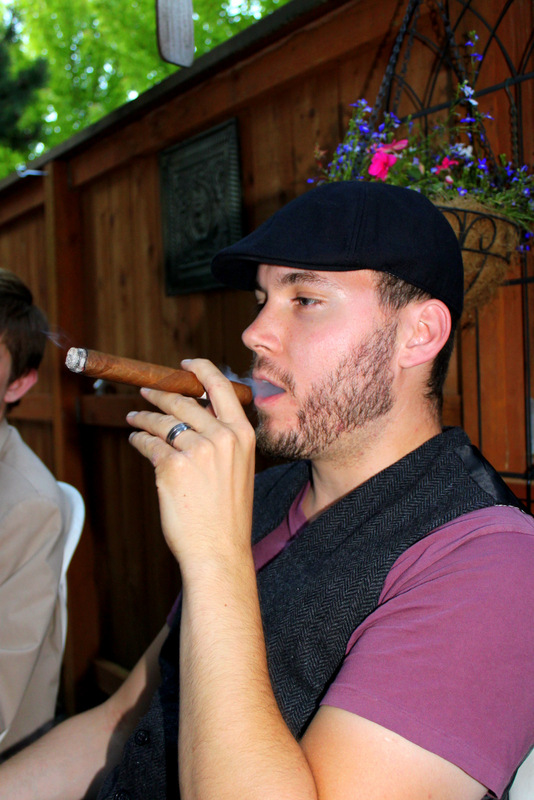 Despite the ambiguity though, I enjoyed the cigar, and Andrew ended up smoking that stick for over two hours without finishing. At $13 a stick, even as a Presidente I don’t know if I’d find myself buying any. Both of the aforementioned cigars had excellent construction, though the Fuente did seem a bit tight. After finishing my first cigar, I considered moving on to a Rome y Julieta Cuban that a friend gave to me, but I decided to save that for next week. And besides, another cigar really wasn’t necessary. The poker hands were moving, chips were trading as often as the jokes were, and good friends got to catch up. Although technically Mr. Aaron Leclaire won the night, Francis Gieringer played the best poker and would have taken the most chips had we not all conspired against him at the end of the night. Next weekend I anticipate that we’ll be expanding even more, which might mean that a new location is in order considering my back patio – wonderful smoking porch that it is – is just a bit too cozy after six or seven people. 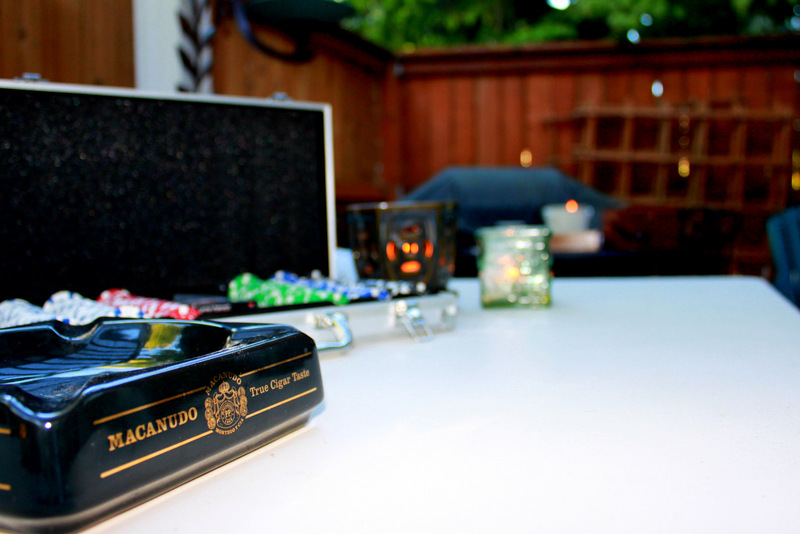 In any case, venues may change, but it is looking like Poker & Stogie night is quickly growing into a new summer tradition that will hopefully enjoyed for many weeks and maybe even many summers in the future. And as the number of people enjoying the summer evenings increases, so will the number and variety of cigars and pipe tobaccos. A very exciting prospect! Events like these make me excited for the FT:NYC smoke-sessions that will be coming up late-August. I’m excited to see some old friends, make some new ones, and simply have a scheduled time to take a break from the hectic New York City lifestyle! In the past week we’ve seen a pretty substantial increase in new traffic to the site (very encouraging! ), as well as a lot of inquiries via our twitter and email, so for those of you just showing up, please note that this site is still under construction. Guy and I are working on bringing all of the pages up to speed – so if you notice any half built pages, those should be up to full capacity soon. Also, if you notice any pages that you think you could add valuable information to (e.g. “Fine Tobacco on the Cheap” or “Locations”), then drop a comment here. We want NYC deals and locations to be a cooperative project between the team and everyone else living in NYC who enjoys fine tobacco. Finally, if you are interested in being a part of the FT:NYC Team as a contributor to the site, send us an email at matthias(dot)clock(at)gmail.com!